Cryptomundo » New Malaysian Bigfoot Tracks! Thanks to historical Malaysian Bigfoot researcher and journalist Harold Stephens, this just came to my attention from Tunku (Prince) Mahmood of Johor. Harold Stephens lives in Bangkok today and maintains good contacts with old friends inside and outside the government in Malaysia. Let’s begin our review of the new Johor footprint photographs with the field report below. Enclosed here are some photos related to the latest footprint discovered in Felda Semenchu. I went to visit the location last month, and managed to find out that there are three eyewitness who have seen the “Bigfoot”. The two persons that I have interviewed are Shahrul (light blue t-shirt) and Raslan (shirt with marine fish). Shahrul, who is a guard has described the creature as hairy, and very large (around 3 meters) but he couldn’t see his face properly. He also mentioned that the creature has a loud breathing sound, and having a stooping posture. On the other hand Raslan with another friend has seen the creature crouching under a palm tree and describe the face as looking like an ape, and has red fiery eyes. I will do a followup on this new development, but first a view of the tracks to see if they diagnostically tell us anything. To begin this examination, what do you see in the report’s details and the photographs that inform us about what might be going on recently in Johor? Two tracks are shown in this photograph. Harold Stephens’ August 1971 article in Argosy is almost legendary within cryptozoology history, for it’s balanced and credible nature. Ivan T. Sanderson was the article’s editor. Stephens has been a generous correspondent of mine, and I appreciate his passing along this breaking news for the readers here at Cryptomundo. Do the photographs of the new tracks seem similar to ones found by Stephens in the 1970s? Please note, Stephens had nothing to do with the finding and photographing of the recent tracks, but merely was informed of these by his old friend, Prince Mahmood of Johor, Malaysia. This entry was posted on Thursday, March 29th, 2007 at 11:01 am and is filed under Artifacts, Bigfoot, Breaking News, Cryptomundo Exclusive, Cryptotourism, CryptoZoo News, Cryptozoologists, Cryptozoology, Evidence, Expedition Reports, Eyewitness Accounts, Malaysian Bigfoot, Pop Culture, Public Forum, Swamp Monsters. You can follow responses via our RSS 2.0 feed. You can skip to the end and leave a response. Pinging is not allowed. I’m hardly an expert on these things, so I won’t offer any opinions here, except some slight hope that maybe something will come out of this one. The unfortunate thing about anything found in Malaysia is that even when good evidence is found, it is going to carry that taint from the whole Johor hominid debaucle. I think this is tragic because I feel that there is a good history of sightings of hairy hominids in this part of the world and that there is a possibility that they exist over there. I think these particular tracks and sightings seem promising, but they are going to be viewed by many with some suspicion because of what happened there in the past. I feel that that whole fiasco should not shut our minds to the possibility of hominids there and that we should try to look at any evidence presented from Malaysia with an open “zen” mind. We should not let that hoax detract from the more credible reports or the possibility that something really is there and therefore close the book on this region of the world. I hope this thing isn’t starting all over again. I’ve read a lot of stories of Bigfoot type animals in the Pacific Northwest and in other parts of North America and some stories from South America. I’ve read some stories from Africa, Asia (Russia, Mongolia, Siberia, China, etc. ), and even some stories from Europe. But, when it comes to places like Malaysia, Vietnam, and Burma I haven’t heard that many stories from those places. Even though it would be an ideal location for an unknown creature to live in. I’m not saying I don’t believe the stories that I do read about, it’s just that it seems like the Malaysia, and Vietnam area hasn’t had as much coverage in books as so many other places. In recent years you always hear about new animals being discovered in places like Malaysia, I hope that with this interest in the area we might start hearing good credible stories from the area. I’ve heard of US soldiers seeing Bigfoot like creatures while during the Vietnam War, but I haven’t read that many. Are there any books out that talk more about these stories? Does anyone know where I can find out more about these Vietnam War encounters? Jeff Meldrum’s book was very instructive for me, and sensitized me as to look for particular characteristics when checking out footprints. These photos scream fake to me. The top most one appears the most obvious. The deepest part of the impression is when the foot-wearing hoaxer attempted to move the foot. Humans would attempt to shove forward, and the deepest part of the impression would be on the outside sector of the inner part of the foot. That is shown straightforwardly in the first photo. The toe impression areas in these photos also show zero adjustments as when a real set of toes would encounter mud, and deal with it. They are too harsh and sharp, like a piece of wood strapped to a foot would provide. Also, there appears to be at least a number of sets of fake feet used here. The toes are not, based on these photos, even consistent, it seems to me. And why don’t we see a fairly complete set of photos of a walk-way of these prints…like perhaps 10 or 12 or 16 of them? We got that from the Patterson-Gimlin site. I am willing to wager that such photos aren’t available from this specific Johor incident. It could belong to a nonhominid Ape genus like Gigantopithectus that is known to have survived into the Pleistocene.The Orang Pendek is either a small species of Orang or an undescribed species of Gibbon. BugMO – A wonderful resource on this subject is: “The Field Guide to Bigfoot and Other Mystery Primates”. It describes the strange and elusive mystery primates from around the world. Unfortunately I’m at work and don’t have my copy with me, but I highly recommend this book if you are at all interested in this sort of thing. In fact it was written by cyrptomundo’s own Loren Coleman, so I’m certain he could hook you up with a copy, and you’d be supporting this great website while expanding your knowlege. A true win win. In Lorens book “The Field Guide To Bigfoot and Other Mystery Primates”, he talks about the Malaysian creature called “sakai” or “devil sakai”. It is also called “stinking one”. It is 5′ 5″ tall. Although these tracks shown are much bigger than something five feet tall. They could be of another type of Hominid. I hope there is more to this story. There are things about these that look fake, that we’ve discussed recently, there are things that look more real than the typical fakes, as well. What do monitor tracks look like? Monitor lizard tracks look nothing like that. sschaper, I agree that other explanations (such as other creatures) should be looked into. However, I will say that these probably aren’t Monitor lizard tracks. These tracks were discovered by indigenous persons there, not Westerners. They would know the difference between a lizard and a hominoid. The tracks’ shape (outline, exterior) just don’t meet the “appearance” test to me. They look like a rough, shaped out piece of wood. No features within the imprint either. Perhaps Loren could track down actually prints of Monitor Lizard tracks, and post them here, and do a comparison. That would be helpful. Just an additional set of opinions. Sanderson’s book (“Abominable Snowman: Legend Come to Life” , if I remember the title correctly) had a whole section on Malaysian sightings. This book dates back to the 60’s, long before the Johor hominid fiasco. Again, if I remember correctly (I’m at work) the sightings were a distinct mix; some of the reports were of Bigfoot-type creatures while others were more reminiscent of Almas or some other form of primitive man. Too many fakes out there. Can’t rely much on footprints anymore. Thanks for the advice LeCope, but I already own “The Field Guide to Bigfoot and Other Mystery Primates”. Actually I own two copies. Thanks anyway. We’re gonna see the eyes aren’t we???? Look closely, am I imagining it, or do both these “feet” have their big toes on the right side? The right hand foot in the photo showing both prints has a little toe on the inside getting larger going out. The opposite of what it should be. Old Yeti tales talk of the creatures having their feet backwards, but I’ve never heard of two left feet on one. Is April 1st a bit early? Thank’s The_Carrot, I also own Sanderson’s book, but I haven’t read about the section on Malaysian sightings. I been buying so many books recently that I’ve must have started reading about five or more of them, but each time I get a new book I start reading that one and I forget about the others. Anyway, thank’s again for the advice I’ll start reading Sanderson’s book again. The only thing I am wondering about is the 3rd pic, starting with the very top one. I dunno why, but it looks more bearish to me. The rest of them look fine to me, though that critter needs to trim its toe nails. The top pic’s print looks more dinosaurish. Too big and flat to me a bipedal primate. Of course the camera angle is distorting the human foot there as well. Without more context with these current pictures these tracks could easily have been made with a crude wooden form applied to the foot. It even looks like the track series is of two left feet. Obviously the tracks were embedded when the mud was wetter. I wonder why no leeches are visiable on the ground there? Almost a year ago I was in Malaysia researching Bigfoot and we found one eyewitness who drew us a picture of a track he had seen. The young man was an official park guide and new the distinction between the sun bear and this odd track he had found. The picture looked exactly like these track pictures. Asking about whether or not the Johor Bigfoot smells or stinks, I found that mention of a smell is totally lacking there. Most people who have contact with great apes or just about any animal living in the wild mention a smell of some kind. Asking Orang Asli natives about the smell I came up with zilch as well. My local guides told me that these Bigfoot creatures loved to eat Durian though. Maybe the smell is so familiar to the locals that they aren’t putting two and two together here. I asked the Orang Asli village headmaster about what these creatures eat and he reached over and pulled up a large turtle pointing excitedly to it, explaining that this is what they eat. There are lots of turtles in Malaysia. I forgot to mention that we also had two eyewitnesses draw on the ground tracks of the creature they had seen. It looked just like these as well. These villagers don’t travel very far in their country and to have this information forthcoming from very remote, isolated areas is perplexing. The main occupation for these eyewitnesses is rattan gathering. They go out into the jungle edges and pull down rattan strands and beat it against the ground, possibly making enough noise to peak a creature’s curiosity nearby. The jungle is so thick in these areas that when I was but a few feet in I didn’t know that an elephant was just on the other side of a tree from me. I saw the trunk lift along the tree. I did hear it though. As we were driving into the jungle we did come across a giant water monitor lizard, maybe 5 feet long. It was very quick, crossing the road in just a couple of seconds and disappearing quickly. The feet were small, no more than four inches long and not shaped like these at all. 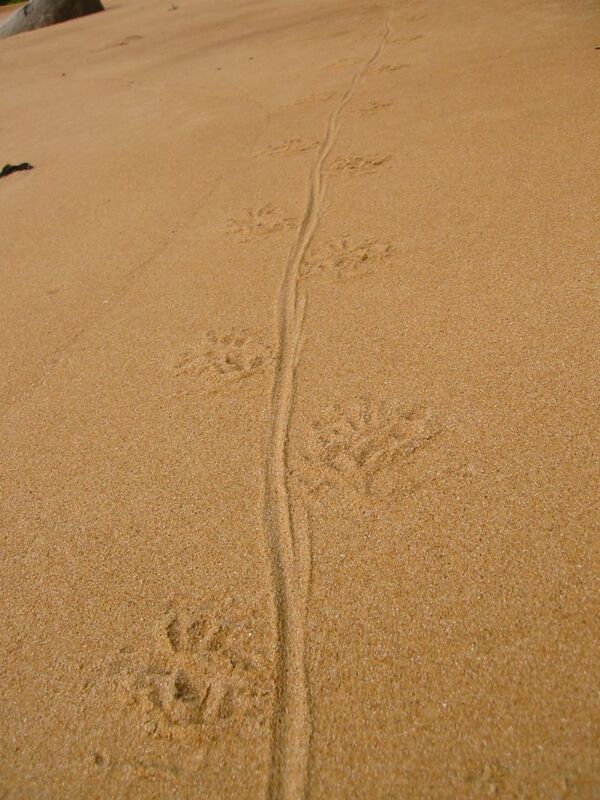 Thanks LeCope for posting the image URL link to the Monitor lizard tracks. It looks more and more like these specific photos recently taken are linked to a hoax. Doesn’t mean that there isn’t a hominoid bipedal in Maylaysia, or in Indonesia. Just that these photos aren’t of their tracks. I had no idea what a monitor lizard’s tracks looked like, but like another commenter, those tracks looked either fake, or reptilian, and a giant monitor was known to be in Australia in Dreamtime, so not an inconceivable cryptid for the region. To Beachboy03. Sakai is a name of a tribe of Orang Asli (aboriginal tribesmen) who live in the jungles of Malaysia. I live next door in Singapore.